I posted about my Pumpkin Dinner Rolls three years ago and that was the first time I had ever had a savory pumpkin bread. It honestly changed the way I thought about pumpkin. 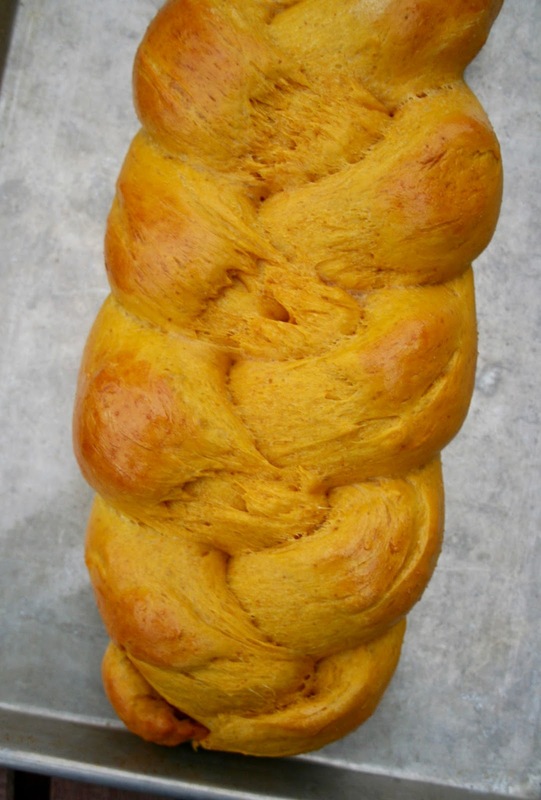 With this braided pumpkin bread, the pumpkin is so subtle and it makes it SO fluffy. And check out that beautiful color! Isn't it pretty? 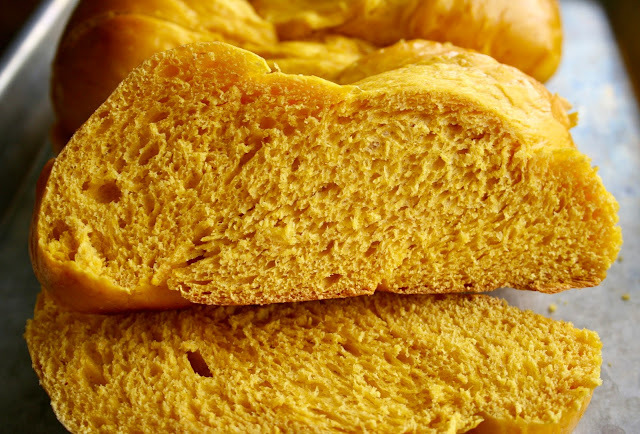 This bread is perfectly soft with an amazing taste and is so easy to make! It requires a bit of rising time, but of course that part is all hands free. It goes perfectly with soups, stews and some honey and butter slathered on. If you have a cup of leftover pumpkin puree sitting in your fridge, be sure to make this recipe right away! 1. Dissolve the yeast into the water in a large mixing bowl or bowl of a stand mixer. 2. Add in the pumpkin, milk, butter, egg, brown sugar and salt. Mix until well combined. Add 1/2 cup flour at a time until a nice, soft dough forms. 3. Knead the dough for 5 minutes or so until is smooth and elastic. Place in a lightly greased bowl, cover and let rise about 1 hour. 4. Divide the risen dough into thirds. Roll out each third into a long snake or rope (about 18 inches long). Lay the 3 ropes next to each other on a lightly greased baking sheet. On one end of the rope, pinch the 3 strands together and begin to braid. When you've braided the entire loaf, pinch the remaining ends together. 5. Cover and let rise another 30 minutes. Brush the braided dough with the lightly beaten egg. 6. Bake at 350 degrees for 25 minutes until golden brown. This looks like something delicious. I must say, this is the first time I'm seeing a bread like this. It seems like it will have a really unique flavor.